If you're not familiar with mechanical switches, they are much higher quality than typical keyboards. Cherry keys are manufactured in Germany with high precision. They have a premium feel that lasts up to 50 million presses per key. You can decide whether to operate by USB or Bluetooth. While USB is plugged in, KeyMouse Track will use the USB interface and charge the batteries. When you unplug the USB connection, the devices automatically switch to Bluetooth Wireless mode. You can change the function every key and button on KeyMouse Track (including the commands for scrolling up and scrolling down on the scroll wheel for both left/right hands). There are 6 key layers that can be saved into the devices. When plugged into the PC via USB cables, batteries automatically charge. KeyMouse devices stay in sync with each other using an RF radio signal between them. This is important for both devices to stay in sync with each other because the computer sees them as separate devices, but they have to work together. For example, when you press FN Yellow on the left hand, the right hand needs to switch to the FN Yellow layer, also. Inter-device communication is also critical for functionality on some operating systems like Mac for keys like Shift, CTRL, ALT, and Command to work properly with 2 input devices working together. Each KeyMouse has a USB port on the back to allow easy chaining of the devices (or plugging in another device into the back of KeyMouse). Each key has it's own circuit board with a diode to prevent ghosting. 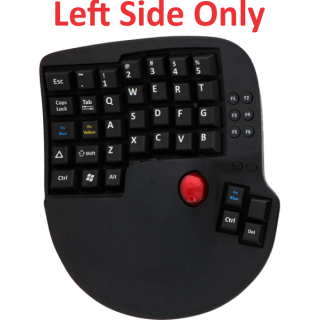 You can program keys to adjust the speed/DPI of left/right or both hands. We have many options such as adjusting speed while a key is held down (and it reverts back to previous speed when key is up), adjust speeds faster, or slower, etc. "Post" buttons in the middle of YUHJ keys and RTFG keys (can be assigned as mouse click buttons). Chair mount cutout is 82.5mm wide, approx. 53.5mm deep (from shortest point on curve), and 35.5mm tall. Weight - One device (such as Right Hand Only) weighs approx. 1lb 3 oz (539 g) without the battery and 1 lb 4.2 oz (573 g) with the battery. Weights include the filler piece for the cutout area. 1. There may be minor cosmetic flaws, but the functionality should work well. 2. Does not have backlighting, and Fn Yellow and Fn Blue key layers do not match perfectly with the software, but they are very close. 3. KeyMouse ChairTrack is not painted, as there is no need for your hands to grip the device like KeyMouse Alpha. 4. For best results, trackballs need removed and cleaned every few days. 5. For dimensions, click here. Currently we will cover any defective parts + shipping to your location. You will be responsible to replace the parts. Warranty does not cover any damage you cause to the devices. We will offer you a 30 day return policy from the time of delivery. If you feel like it doesn't work for you, you can return it. You will be refunded the price of the product minus a 10% product return fee. You will be responsible to pay for return shipping. It must be returned in the original packaging, include all hardware and components, and be in perfect condition, both cosmetically and mechanically. Keep up to date with the latest news about Keymouse. Contact us at: support@keymouse.com | KeyMouse is a trademark of ZZ, Inc. Copyright © 2019, ZZ Inc.